Rugged styling with a professional grade features. 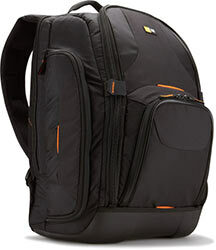 The Case Logic SLRC-206 SLR Camera/Laptop Backpack is a tough and ready SLR backpack that is designed to keep pace with your approach to photography. Rugged styling with a professional grade interior and organization will take you anywhere the shots are waiting. The bag features a dedicated computer compartment, and removable wall and flexible shelves to cradle a camera body and lens. An internal hammock system suspends your SLR above the bottom of case, providing superior impact protection.